Air conditioning, washing machine, hair dryer, wireless internet access, cable/satellite television, walk to shops, can manage w/o car. -Local tourist tax of €1/day/adult. Living room with convertible sofa. Another view of the living room with dining area. The dining area with view of the church. Bedroom with two single beds(can be made as one). The bathtub with shower over. This apartment is on the sixth floor with elevator. 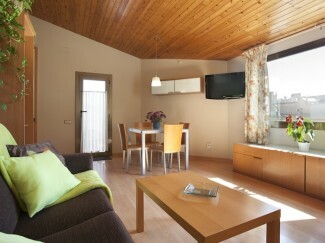 It is bright, clean, comfortable and a real haven to return to after a day exploring vibrant Barcelona. There is a open living room/dining room and well equipped separate kitchen. There is one bedroom with 2 twin beds(can be made as one). The bathroom has a bathtub, shower over, sink and toilet. There is a large window with views of Santa Maria del Mar Gothic church-- a great view. And the special treat is the private terrace. The apartment is air conditioned, making this a very comfortable accommodation even in summer. "Central location near the Metro. Pleasant and functional. Liked the rooftop location with no one above. Relatively quiet with little street noise."